Here I provide some evidence that Japan's economy has actually fared quite well since 1990, using data on population and real GDP from the World Bank. 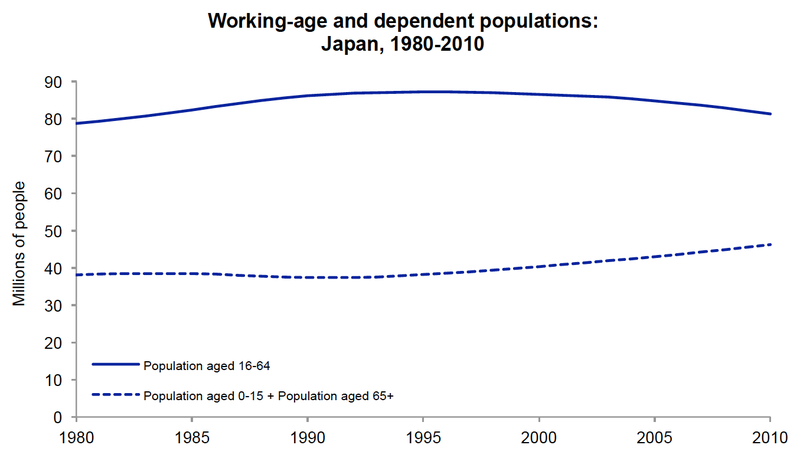 The first chart (below) plots Japan's working-age and dependent populations between 1980 and 2010. The working-age population comprises individuals aged 16-64; the dependent population comprises those aged 0-15 and those aged 65+. Beginning in the mid-1990s, the working-age population began to shrink, while the dependent population began to expand. This means that, since about 1994, each successive year's output has been produced by a smaller number of workers, yet the overall population has not been in decline. 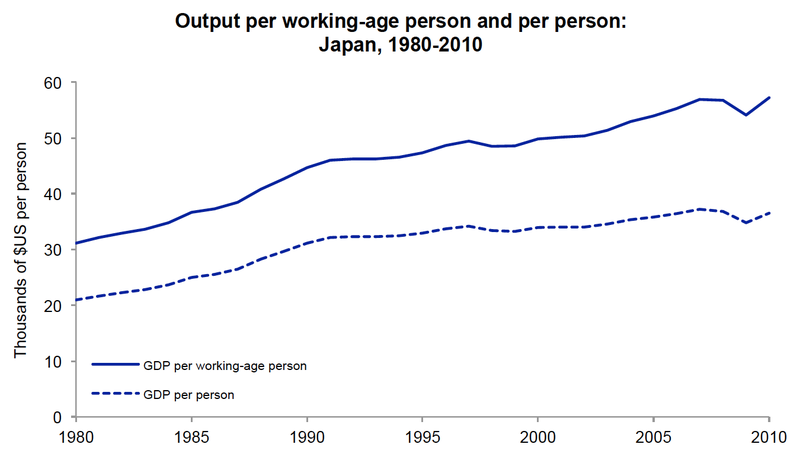 The second chart (below) plots Japan's real GDP per working-age person and real GDP per person over the same time period. Since 1990, the increase in real GDP per working-age person has been considerably larger than the increase in real GDP per person, which suggests that the apparent stagnation of the Japanese economy owes more to changing demographics than to deflationary trends. Indeed, Daniel Gros argues in The Guardian that, once changes in countries' workforces are taken into account, Japan has actually performed better than many European economies over the last decade. Eamonn Fingleton makes a similarly revisionist argument in Forbes. Are UKIP supporters right-wing or left-wing? It is well-known that, in the last few years, UKIP has gained considerable popularity among individuals who want less immigration. For example, a 2013 YouGov poll found that 98% of UKIP supporters thought that the last Labour government let in too many immigrants. In addition to being anti-immigration, UKIP takes a strong position against the EU. Consequently, UKIP is widely regarded as a right-wing party. However, evidence from public opinion suggests that classifying UKIP may not be quite so simple. Here I present data on the economic views of UK adults broken down by voting intention, from two YouGov opinion polls. The first, carried out in 2013, concerns price controls and government ownership of industry. The second, carried out in 2014, concerns the top rate of income tax. 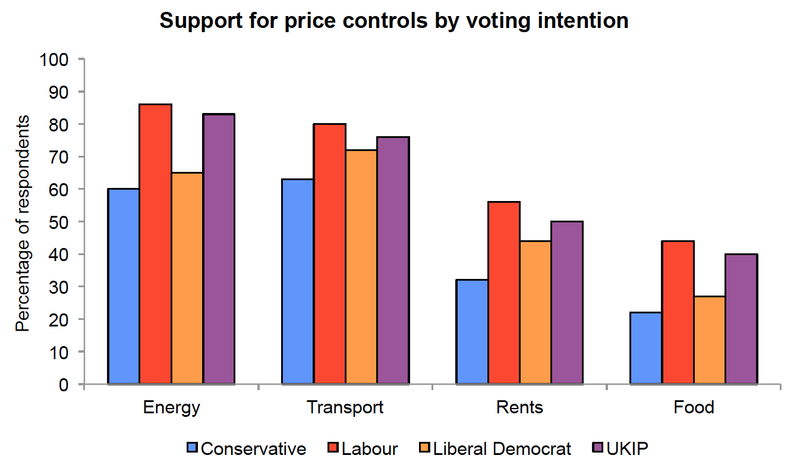 The chart below displays percentage support for price controls by voting intention. Each cluster of bars corresponds to a different industry, and each bar represents a different party. Unsurprisingly, Conservative supporters are the least likely to support price controls, while Labour supporters are the most likely. Interestingly, however, UKIP supporters are the second most likely to support price controls; in all four cases, they are closer to Labour than the Conservatives. The next chart displays percentage support for government ownership by voting intention. Conservative supporters are the least likely to support government ownership, while Labour supporters are the most likely. 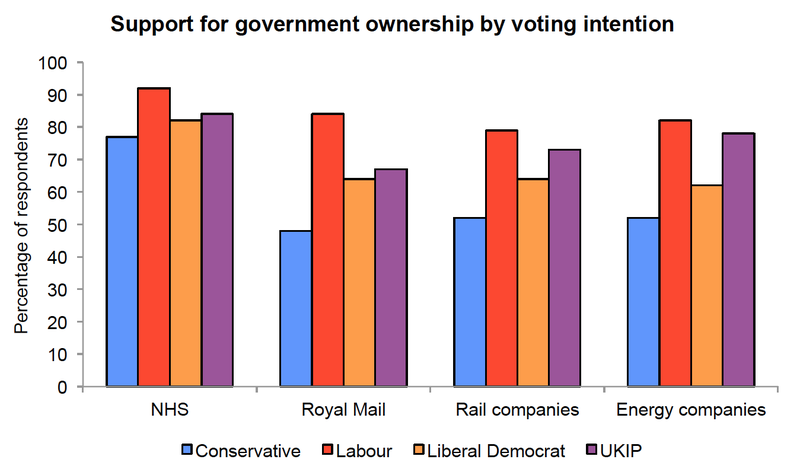 Yet once again, UKIP supporters are the second most likely to support government ownership; they are closer to Labour in three out of four cases. 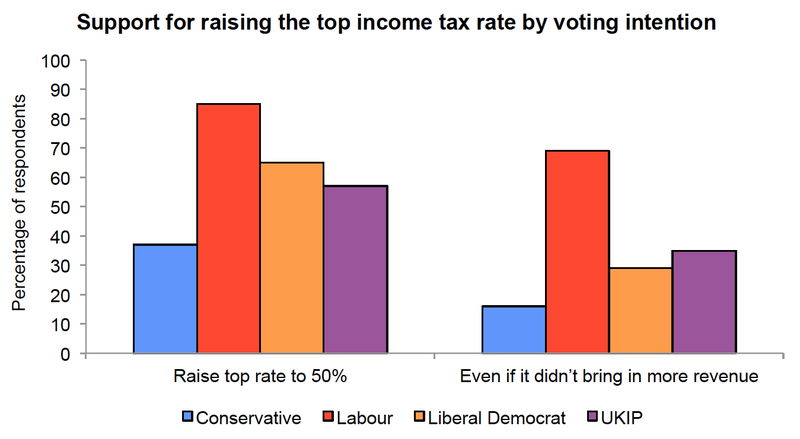 The final chart displays percentage support for raising the top income tax rate by voting intention. Conservative supporters are the least supportive, while Labour supporters are the most supportive. Here UKIP supporters come about half-way between Labour and the Conservatives, in fact falling slightly closer to the Conservatives. When asked about simply raising the income tax, UKIP supporters are the third most supportive, yet when asked about raising the income tax under an assumption of no additional revenue, they are the second most supportive. These results suggest that characterising UKIP as a right-wing party is simplistic at best. While it is not exactly clear where UKIP lies on the political compass, the case for putting it in the libertarian-right quadrant is evidently quite weak. A major caveat, of course, is that the views of UKIP supporters may not reflect the policy agenda of UKIP itself. As those who have advanced arguments for natural rights to property admit, any such argument is inevitably predicated on a theory of initial acquisition. Individuals do not come into the world with a universally acknowledged claim to a particular collection of property encoded in their DNA. Any property that is not purchased or inherited must be acquired somehow. The most commonly cited theory of initial acquisition, which owes its origin to John Locke, is the so-called labour theory. (If anyone knows a better theory, I would genuinely be interested to hear about it.) In The Second Treatise on Government, Locke asserts, "Whatsoever then he removes out of the state that nature hath provided, and left it in, he hath mixed his labour with, and joined to it something that is his own, and thereby makes it his property." The claim is that a person who improves some resource by mixing his labour with it thereby acquires a natural right to the resource. The main problem with Locke's theory, in my opinion, is that it is wholly arbitrary. To begin with, it does not specify how much labour a person must undertake before he may acquire a natural right to a particular resource. If someone chops down ten trees and builds a log cabin, has he acquired a natural right to the cabin? What if he chops down the trees and starts building the cabin, but does not finish it? What if he just chops down the trees? What if simply touches one tree with the blade of his saw? Suppose a person arrives at a hitherto unclaimed forest, and makes a tiny incision in every single tree. Does this give him a natural right to all of those trees? Suppose a person goes fishing in an otherwise deserted stream every day for two months. Does this give her a natural right to the entire stream along with its constituents? Locke's theory is arbitrary not only with respect to the quantity of labour necessary for acquisition, but also with respect to the extent of acquisition. If someone acquires a natural right to a certain piece of land by mixing her labour with it, does she then also acquire a natural right to a column of air going infinitely far above the land and a column of crust going downward toward the centre of the earth? Similarly, if smoke from someone else's factory blows into the air immediately above her land, has her natural right to the land then been violated? What if the smoke blows into the air ten feet above her land? What if it blows into the air one hundred feet above her land? As far as I can see, there is no non-arbitrary way to conceptualise the initial acquisition of property. Consequently, it does not seem possible to meaningfully claim that individuals have a natural right to property they have acquired. And since all property must at some point have been acquired, it does not seem possible to meaningfully claim that individuals have a natural right to property they have purchased or inherited either. In response to my recent post about Paul Krugman's income, several people have raised the objection that, even if Krugman is in the top 1 percent, the fact that he often speaks critically about the top 1 percent does not make him a hypocrite. There are conditions under which this is indeed a reasonable objection. Here I would like to clarify those conditions. Suppose one agrees that, over the last few years, Krugman has made at least several generalisations about the top 1 percent of earners, in each case casting them in a negative light. Suppose also that Krugman happens to be in the top 1 percent himself. And suppose a hypocrite is someone who speaks disapprovingly of people with property X, where X is something under an individual's control, while at the same time having property X himself. If one agrees that making generalisations about a group of people that cast those people in a negative light counts as speaking disapprovingly of them, then Krugman is a hypocrite. However, it could be argued that making negative generalisations about a group of people does not actually constitute disapproval of them. Therefore, it is possible that Krugman could simply be described as a self-deprecator, rather than a hypocrite. Furthermore, a friend of mine rightly pointed out that it would be absurd to think that Krugman makes negative generalisations about the top 1 percent of earners simply because they happen to occupy the top 1 percent of the income distribution. However, the fact that making such generalisations may imply Krugman is a hypocrite (in particular, if one accepts the argument above) is precisely the point. In other words, the fact that Krugman, someone who we have no reason to think acquires his large income through illicit means, may belong to the top 1 percent illustrates why lumping everyone in the top 1 percent together is unhelpful and misleading. Is Paul Krugman in the top 1 percent? It was recently reported that Paul Krugman will be paid $225,000 in his first year at CUNY, his new academic institution. Some pundits have called Krugman a hypocrite for accepting such a high salary, given his regular criticism of the top 1 percent. However, when combined with his other sources of income, does the salary actually put Krugman in the top 1 percent of earners? This blog post will attempt to find out by providing plausible lower and upper bounds for Krugman's yearly income, and then comparing these to plausible cut-off points for the top 1 percent of earners in the US. Krugman probably has five main sources of income: his academic salary, his salary as a columnist for the New York Times, speaking fees, investment returns, and royalties from his best-selling textbook. The first figure we know, namely $225,000. Interestingly, as the Daily Beast article (link above) points out, Krugman was probably making even more than $225,000 per year when he was at Princeton, which may imply that Krugman's detractors could have been calling him a hypocrite even before his move to CUNY. Regarding his salary as a columnist, New York Magazine reports that columnists at the New York Times are paid between $150,000-350,000 per year. In a separate article, it reports that Thomas Friedman, another famous columnist at the New York Times, earns $300,000 a year. Therefore, a reasonable lower bound for Krugman's salary as a columnist is $150,000, and a reasonable upper bound is $300,000. Regarding his speaking fees, Krugman has written two short pieces, Me and Enron and My Connection with Enron, One More Time concerning his business with the former energy company Enron. In the first, he writes, "I was routinely offered as much as $50,000 to speak to investment banks and consulting firms." In the second, he writes, "In 1998-1999 my normal fee for a one-hour business speech in Boston or New York was $20,000". These figures are consistent with speaking fees for other top economists. For example, according to the paper by Chan et al. (link in previous sentence), Joe Stiglitz's minimum speaking fee is around $30,000. In calculating the lower bound, I will assume that Krugman gives one talk every two years, which makes his annual income from speaking $10,000. In calculating the upper bound, I will assume that he gives two talks per year, which makes his annual income from speaking $40,000. Regarding his textbook royalties, all I have to go on is this statement that he made in 2010: "I'm the co-author of two college textbooks, and royalties from the intro one are a large part of our family income." In calculating the lower bound I will assume, completely arbitrarily, that by "large" he meant $25,000. And in calculating the upper bound, I will assume that he meant $75,000. Overall then, what is Krugman's total pre-tax income? A plausible lower bound is $225,000 + $150,000 + $10,000 + $13,500 + $25,000 = $423,500. And a plausible upper bound is $225,000 + $300,000 + $40,000 + $40,500 + $75,000 = $680,500. Does this put him in the top 1 percent of earners? The lowest cut-off point for the top 1 percent that I could find for 2012-or-later was $394,000, a figure that was cited in both a CNBC article and an Oregonian article. The highest cut-off point that I could find was $521,411, a figure that was cited in an article at Investment U. These two figures are similar to the lower and upper cut-off points for 2009 reported in this article at Bankrate. Consequently, if the upper bound for Krugman's total income is correct, then he is almost certainly in the top 1 percent, but if the lower bound is correct, then he might not be in the top 1 percent. If the average of the upper and lower bounds is correct, then he is very likely to be in the top 1 percent. 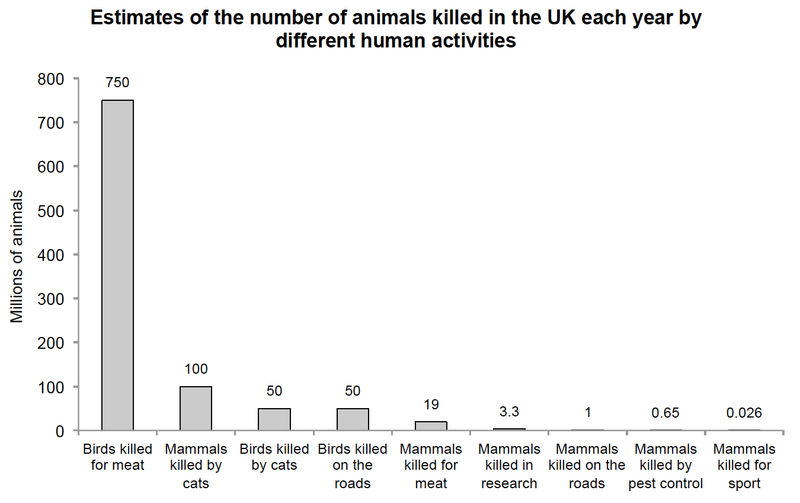 Which human activities kill the most animals in the UK each year? The chart below displays the numbers themselves. Roughly 750 million birds, mostly chickens, are killed for meat. About 100 million mammals, mainly mice, voles and shrews, are killed by pet cats. Approximately 50 million birds are killed by pet cats. About 50 million birds are killed on the roads. Roughly 19 million mammals, including cows, pigs, sheep and goats, are killed for meat. About 3.3 million mammals, mostly mice, rats and guinea pigs, are killed in scientific research. Approximately 1 million mammals, largely rabbits, hedgehogs and squirrels, are killed on the roads. About 650,000 mammals, mainly rats, are killed by pest control. And roughly 26,000 mammals, mostly foxes, are killed for sport. Several other human activities probably kill large numbers of animals in the UK. These include air pollution from vehicles and factories, habitat destruction caused by development, and the production of grains for food. Indeed, it has been argued that switching from meat production to grain production would cause a net increase in animal deaths, at least in Australia. Sources are as follows. The figures on animals killed for meat are from the Humane Slaughter Association. The figures on animals killed by pet cats are from The Mammal Society. The figures on animals killed in research, as well as those on animals killed by pest control, are from Understanding Animal Research. The figures on birds killed on the roads are from a report detailed in the Independent. The figures on mammals killed on the roads are from the People's Trust for Endangered Species. The figures on mammals killed for sport are from a report detailed at the BBC. How much has immigration contributed to population growth in the UK? Immigration is a highly politicised topic in the UK, having come to the forefront of the political debate over the last few years. In this post, I do not take a position in the debate over immigration; nor do I even analyze any of the relevant arguments. Rather, I simply consider the extent to which recent immigration has contributed to population growth. It is widely believed, rightly or wrongly, that immigration was too high under the previous Labour government. And this is true not only among Conservatives and UKIP supporters, but among Labour supporters and Liberal Democrats as well. A 2013 YouGov poll found that 74% of Labour supporters and 59% of Liberal Democrats, along with 92% of Conservatives and 98% of UKIP supporters, thought that the last Labour government admitted too many immigrants. And according to a 2012 YouGov poll, among individuals who voted Labour in 1997, 67% of those who also voted Labour in 2010 want zero net migration, while 78% of those who voted for another party in 2010 want zero net migration. The first chart (below) plots net migration in the UK between 1970 and 2012, using data from the ONS. Between 1970 and the early 1980s, net migration was low and negative. It turned low and positive during the mid-1980s. Beginning in approximately 1997, it increased markedly to about 150-200 thousand net migrants per year, where it remained throughout the 2000s. The second chart (below) plots cumulative change in population between 1997 and 2012. The continuous line describes the change that was actually observed, while the dashed line describes the change that would have been observed if net migration had been zero. By 2012, the actual population was 5.06 million larger than it had been in 1997. Under zero net migration, the population in 2012 would have been 2.19 million larger than it had been in 1997. Therefore, approximately 57% of the population growth that took place between 1997 and 2012 may be attributable to immigration. Overall, the UK population might have been 5% smaller by 2012 under zero net migration. Note that this analysis only considers the direct effect of immigration on population growth. It does not account for differential fertility between immigrants and natives.